Owning a home can give a person a sense of satisfaction. It is however not without responsibilities especially when it comes to maintenance and repairs. It is a known fact to all homeowners that somewhere along the way, something in the house will need repair or replacement. Some may be simple enough for us to fix on our own however; there will be issues that will need a professional to fix. One perfect example that requires an expert’s attention would be garage door problems. Some would attempt to do these on their own thinking that they can get to save money by avoiding service fees. Unfortunately, doing it on your own can both be dangerous and cumbersome. In times like these, call us at the Garage Door Repair Businesses in Sacramento, California for professional service. It can be very dangerous for someone with no experience to be working on broken spring repair or replacement. One needs to have extensive experience or training especially on the parts and function of each part to take such undertaking. Garage doors have two types of springs, the extension and torsion springs. For lighter doors, the extension spring is usually employed; this is mostly used on sectional and one-piece tilt-up garage doors. These are located on the door tracks and should never be replaced or repaired unless they are professionals because there have been numerous reports of injury and fatal accidents caused by such. For heavier doors, the torsion spring is mostly used and is located on the top of the doors. 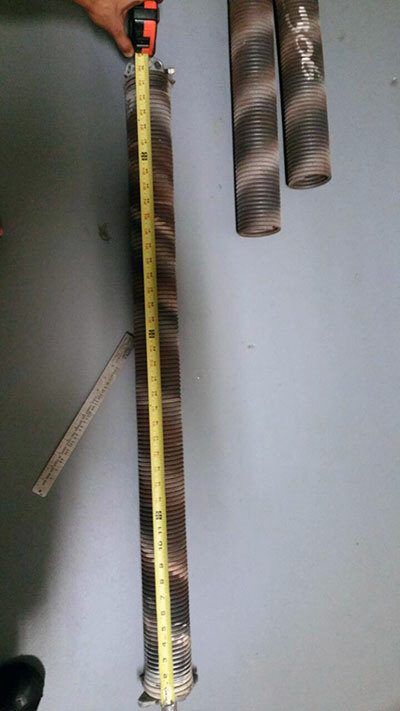 Some people think that extension spring is something that they can fix on their own; however, you should not attempt to do so unless you have the background, as it can be as dangerous. One thing that all garage door owners should keep in mind is that, safety should come first and by hiring a professional, you get not only excellent service but danger-free as well. Hiring a certified professional garage door technician from our company for the replacement of your broken springs has multiple benefits. Our service window assures you of our availability anytime you need help. Another reason to hire our professional is that all our technicians went through extensive training and are certified to perform such functions assuring you of a risk-free and quality service each time. One of the most important part of your garage door are the springs, without them, your doors will be deemed useless, so it is just fitting that you give it the proper care and maintenance that it needs so that it will stay safe and operational for a very long time. For all garage door broken spring repair and replacement, trust our professional technicians in Sacramento, CA to give you the best garage door service that your home deserves. 10,000 more cycles to your door springs from proper care will surely give you more savings in the end, so there is really no need to worry about getting the replacement or repair done by yourself. Only trust the experts and professionals to keep your garage doors functional and working for a long time. In this area, you can trust our garage door company to give you the savings that you are looking for and the safe and quality service that you and your home deserve.